Members of the public browse art in Terakedis Fine Art during the December 2018 ArtWalk in downtown Billings. The Winter ArtWalk will be Friday, Feb. 1 from 5 – 9 p.m. Held at a variety of downtown locations, the February event will feature original art and fine crafts, as well as gallery talks, artists in attendance, music and refreshments. Isabel Bonilla works on her mixed media art piece during the quick draw event at the Yellowstone Art Museum opening event for the 51st Annual Art Auction on Friday, Jan. 25, 2019. "Shiphead" by Emily Davidson is one of several pieces that will be on display during the Feb. 1 ArtWalk. Davidson is showing her work at 2905, located at 2905 Montana Ave., along with Renee Audette, Emily Davidson, Louis Habeck and Chris Diamond. Kelsey Bowen's "On Your Grave" will be on display at Rocky Mountain College's Ryniker-Morrison Gallery from Feb. 7 - 28 as part of a display of Red Lodge Clay Center artists. Bowen studied at the California College of Arts and Ceramics and has been featured in exhibitions at LA's American Museum of Ceramic Arts. Bowen began work with the Red Lodge Clay Center after earning her undergraduate degree. Bowen’s work is inspired by the truth and fairy tale elements in child imagery. "To dwell within the naivety of childhood is to simultaneously exist within both a fairy tale and a nightmare,” she said. "A New Direction" by Stephen Haraden, evoking the styles of internationally known artists Piet Mondrian and Hans Hofmann and beloved Billings ArtWalk patron, Donna Loos, will be on display at Haraden's gallery, 2911 Second Ave. N. #235, during the Winter ArtWalk. The public is invited to a free screening of the documentary “Silent No More” on Feb. 4. The film will be shown at the Lincoln Center, located at 415 N. 30th St. In a news release, Billings Urban Indian Health and Wellness Center said the 52-minute film, created by White Bison Inc. and the Wellbriety Movement, presents an authentic look at violence against Indigenous women, as well as the issue of missing and murdered Indigenous women. Acrylic artist Jean Posusta will be exhibiting work at the First Congregational Church UCC, 310 N. 27th St., during the winter ArtWalk on Feb. 1. With fellow artist Jennifer Parry, Posusta will be exhibiting and demonstrating quick draw techniques from 5 - 9 p.m.
Angela’s Piazza, a drop-in center for women, will hold a 'Souper Bowl' on Friday, Feb. 1. The 16th annual fundraiser lunch and dinner will take place at American Lutheran Church, located at 5 Lewis Ave. For $30, diners will receive a hot bowl of soup made by a local restaurant and then take home a unique wooden bowl donated by Yellowstone Wood Turners. This year, diners also have the option of ordering a flight of three soup samples. From left, Pam Havig, Shawn Bettise, Aaron Going, and Zoe Friez act out a scene from "Be My Baby," opening Feb. 1 at Billings Studio Theatre. The Tony-nominated country music hit "Pumpboys and Dinettes," will be performed at Cassie’s Supper Club beginning Jan. 24. This House of Books cooperative bookstore, located in downtown in Billings. Master drummer Darrell Green and saxophonist Matt Otto will headline MSUB’s Jazz Festival on Feb. 7. People walk between galleries on North Broadway during the Christmas Stroll and Art walk in downtown Billings on Friday, Dec. 7, 2018. ArtWalk: 5-9 p.m. Downtown. Artwalkbillings.com. Art Bites: Noon-1 p.m. Crooked Line Studio, 3330 Fourth Ave. N. Create art on small canvases, cards, gift tags, magnets, and more using acrylic paint, watercolor, stamps, collage, markers, inks, etc. 927-8041, crookedlinestudio.com. Class "Isabel Bonilla: Swirly Zebra": 6-8 p.m. Crooked Line Studio, 3330 Fourth Ave. N. $35. 927-8041, crookedlinestudio.com. Class "Julie Durrett: 2019 Vision Boards": 6-8 p.m. Crooked Line Studio, 3330 Fourth Ave. N. $28. Supplies included, but bring personal items to include in collage. 927-8041, crookedlinestudio.com. Open studio: 9-11 a.m. Crooked Line Studio, 3330 Fourth Ave. N. 927-8041, crookedlinestudio.com. That's Amore exhibition: 5 - 8 p.m. Durden Gallery, 2501 Montana Ave. St. 4. Valentine's Day inspired artwork featuring artists Catherine Courtenaye, Nick Lamb, Randi O'Brien, Arin Waddell, Theodore Waddell, and gallery owner Bob Durden. Refreshments provided. 413-5769, www.durdengallery.net. Souper Bowl fundraiser: 11 a.m.-1:30 p.m. and 4-6:30 p.m. American Lutheran Church, 5 Lewis Ave. Meal of soup and bread by local restaurants, with unique piece of pottery or wooden bowl by local artists to take home. Gift certificates, take-out meals available. $30. Benefits women’s domestic violence awareness and prevention programs at Angela’s Piazza. 255-0611. Play "Be My Baby” Doors 7 p.m. Curtain 7:30 p.m. Billings Studio Theatre, 1500 Rimrock Road. $20 adults; $18 seniors, students, military. Tickets at box office and billingsstudiotheatre.com. Red Lodge: Call for entries, “Juried National V.” Red Lodge Clay Center. Juried show in September. Submission deadline May 1. Details at redlodgeclaycenter.com. Red Lodge: Opening reception. 5-7 p.m. Red Lodge Clay Center. “In Good Company” by Normandy Alden Posey Bacopoulos, Chandra DeBuse, Elisa Di Feo and Gail Kendall, and works by Ben Krupka through Feb. 24. 446-3993, redlodgeclaycenter.com. Sidney: First Friday Film Series, "The Trouble With Wolves." 7 p.m. MonDak Heritage Center. Free. 406-433-3500, mondakheritagecenter.org. Powell, Wyo. : Northwest Vocal Summit concert. 7 p.m. Nelson Performing Arts Auditorium. Featuring NWC Studio Singers, classical vocalist Daniel Schreiner and contemporary vocalist and composer Erin Bentlage. $10 individual, $25 family of four or more, free NWC students with ID. Red Lodge: Chad Okrusch. 6:30 p.m. The Pollard Pub. Red Lodge: Mike Holm. 5 p.m. The Snag Bar. Cody, Wyo. : Musical "Pumpboys and Dinettes." 7:30 p.m. Cassie's Supper Club. Catfish dinner available 5-6:15 p.m. Show tickets, $15-$25, at Cody Chamber and showtix4u.com. Class "Carolyn Thayer: Eleanor Rigby": 9 a.m.-noon. Crooked Line Studio, 3330 Fourth Ave. N. $48. 927-8041, crookedlinestudio.com. Class "Marcus Rodgers: Snow Place Like Home": 9-11 a.m. Crooked Line Studio, 3330 Fourth Ave. N. $35. 927-8041, crookedlinestudio.com. Class "Shelly Young: Pour More": 5-7 p.m. Crooked Line Studio, 3330 Fourth Ave. N. $38. 927-8041, crookedlinestudio.com. Chitchat & Confections: 4:30 p.m. This House of Books, 224 N. Broadway. Children’s Authors & Illustrators Week celebration. All ages. Free. 534-1133, thishouseofbooks.com. Red Lodge: Workshop "Watercolor Painting." 1-4 p.m. Carbon County Arts Guild & Depot Gallery. With Dolly Frerichs. Ages 16 and older. Bring lunch. $55. Members receive 10 percent discount. Supply list provided at registration. Registration: 446-1370, carboncountydepotgallery.org. Virginia City: Presentation, raptors. 1:30 p.m. Elling House Arts & Humanities Center. Montana Raptor Conservation Center gives overview of what makes raptors unique in the bird world, the raptors of Montana and the importance of raptors to our ecosystem. Admission by donation to the center. Ellinghouse.org. Norris: Lang Termes. 7 p.m. Norris Hot Springs. 406-685-3303, norrishotsprings.com. Red Lodge: Castle Mountain Gang. 9 p.m. Snow Creek Saloon. Red Lodge: Jarret Kostrba. 3 p.m. The Bierstube. Red Lodge: Jonah Morsette. 6:30 p.m. The Pollard Pub. Sheridan, Wyo. : Cantus concert “Alone Together.” 7 p.m. Kinnison Hall at Whitney Center for the Arts. Sheridan College. $25 at box office and whitneyarts.org. Play "Be My Baby” Doors 12:30 p.m. Curtain 1 p.m. Billings Studio Theatre, 1500 Rimrock Road. $20 adults; $18 seniors, students, military. Tickets at box office and billingsstudiotheatre.com. Norris: Wolf and the Moons. 7 p.m. Norris Hot Springs. 406-685-3303, norrishotsprings.com. Cody, Wyo. : Musical "Pumpboys and Dinettes." 3 p.m. Cassie's Supper Club. $15-$25. Tickets at Cody Chamber and showtix4u.com. Class "Carolyn Thayer: Gnome at Home": 6-9 p.m. Crooked Line Studio, 3330 Fourth Ave. N. $48. 927-8041, crookedlinestudio.com. Documentary screening “Silent No More”: Lincoln Center, 415 N. 30th St. Doors open 5:30 p.m. Opening comments and prayer 6 p.m. Congressional representatives introduce video statements of Sen. Tester and Sen. Daines: 6:10 p.m. Film screening 6:25 p.m. Panel presentations 7:20 p.m. Q&A with panel 7:45 p.m. Closing prayer and smudge 8:15 p.m. Free. NEA Big Read book discussion: 5 p.m. This House of Books, 224 N. Broadway. With moderator by Julie Schultz. Free copies of “Station Eleven” by St. John Mandel and discussion registration available at venue. 534-1133, thishouseofbooks.com. NEA Big Read event – panel discussion "The Traveling Symphony": 6:30 p.m. MSUB, LA 205. Msubilllings.edu. Poetry open mic: Sign-up 5 p.m. Readings 5:30 p.m. This House of Books, 224 N. Broadway. 534-1133, thishouseofbooks.com. Sidney: Exhibit opening "Pure Quill." MonDak Heritage Center. Photography by Barbara Van Cleve through April 27. 406-433-3500, mondakheritagecenter.org. Powell, Wyo. : Lunar New Year celebration. 7 p.m. Yellowstone Building Conference Center, Northwest College. Students from China, Hong Kong and Macau discuss how the New Year is celebrated in their native lands. Food, games, activities follow. Free. Nwc.edu. Class "Shelly Young: Pour More": 6-8 p.m. Crooked Line Studio, 3330 Fourth Ave. N. $38. 927-8041, crookedlinestudio.com. Game Night: 5-8 p.m. This House of Books, 224 N. Broadway. Choose from games to play, or take your own. Drinks and snacks available. All ages. Free. Thishouseofbooks.com. NEA Big Read event – “Brazil” film screening: 6:30 p.m. MSUB, LA 205. Msubilllings.edu. MSUB Jazz Festival: Clinics (open to the public) at Cisel Hall and Petro Theatre 9 a.m. Concert featuring Darrell Green, master drummer, and Matt Otto, saxophonist, at Petro Hall 7 p.m. Concert tickets, $10 at door. (MSUB faculty and students are admitted free with ID.) Information, or to register a group for clinics: msubillings.edu/jazz. Crista Ann Ames's "Fox" will be on display at Rocky Mountain College's Ryniker-Morrison Gallery from Feb. 7 - 28 as part of a display of Red Lodge Clay Center artists. Ames captures myth, animals, and the female figure in her sculptures. Her mediums include clay, textiles, and wood. After earning a bachelor's in ceramics with a minor in art history and disability studies, she attended Utah State University for Post Baccalaureate studies in ceramics. She obtained an MFA from the University of Montana. 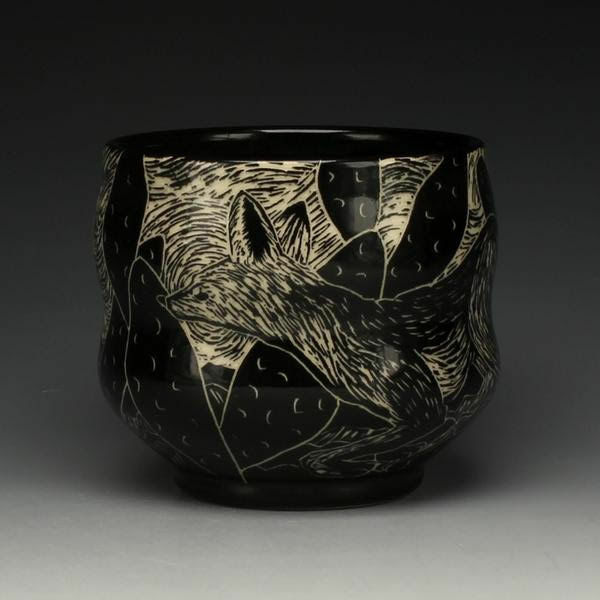 Emily Nickel's "Fennec Fox Bowl" from 2018 will be on display at Rocky Mountain College's Ryniker-Morrison Gallery from Feb. 7 - 28 as part of a display of Red Lodge Clay Center artists. Nickel earned her M.F.A. at Indiana University and has been exhibited across the world from Baltimore, Md. to Kyoto, Japan. Currently, she is an artist and art educator at the Red Lodge Clay Center. Her recent work focuses on ceramic figures of magical animals with humans beside them. “My sculptures reference Portal Fantasy: a literary genre featuring a protagonist’s journey through a magical passageway to another world,” said Nickel. Karl Schwiesow' "Brush, ok, from 2019, will be on display at Rocky Mountain College's Ryniker-Morrison Gallery from Feb. 7 - 28 as part of a display of Red Lodge Clay Center artists. Schwiesow earned a B.F.A. in sculpture and ceramics from Sierra Nevada College in 2012. He went on to earn an M.F.A. from the University of Montana in 2017. Schwiesow has exhibited works in Calif., Nev., Wash., Mont., and Pa. His work captures the breakdown of objects as he reconstructs them. Opening reception: 4-6 p.m. Ryniker-Morrison Gallery, Rocky Mountain College. Group show by Red Lodge Clay Center artists Kelsie Bowen, Crista Ann Ames, Emily Nickel, Karl Schwiesow through Feb. 28. Free. Rocky.edu. Class "Marcus Rodgers: Snow Place Like Home": 6-8 p.m. Crooked Line Studio, 3330 Fourth Ave. N. $35. 927-8041, crookedlinestudio.com. Class "Isabel Bonilla: XUÉ Sun God": 6-8 p.m. Crooked Line Studio, 3330 Fourth Ave. N. $35. 927-8041, crookedlinestudio.com. Valentine Festival 2019: 10 a.m.-6 p.m. Shrine Auditorium, 1125 Broadwater Ave. Crafts, antiques, collectibles, small businesses. Free admission. Contradance Billings: Cedar Hall at MetraPark. Beginners workshop 7:30 p.m. Dance 8-11 p.m. No partner required. $8 members, $10 nonmembers at door. Memberships ($15) also available. Squaredancemontana.com. Norris: Dan Henry. 7 p.m. Norris Hot Springs. 406-685-3303, norrishotsprings.com.